At Counting Sheep Campers, our stylish newly-converted VW campervans are ready to take you, your friends and family on amazing fun adventures, making new memories for the kids and bringing back old memories for the grown-ups. With unlimited mileage, you can explore the UK to your heart’s content, so whether you wish to wander around the Scottish Borders, Lothians, or go further afield to the Highlands & Islands, it’s your choice. Our modern VW campervans are easy to drive, fitted with satnav, simple to park (with inbuilt reversing cameras) and straightforward to drive onto car ferries to explore the Islands. It couldn’t be simpler! 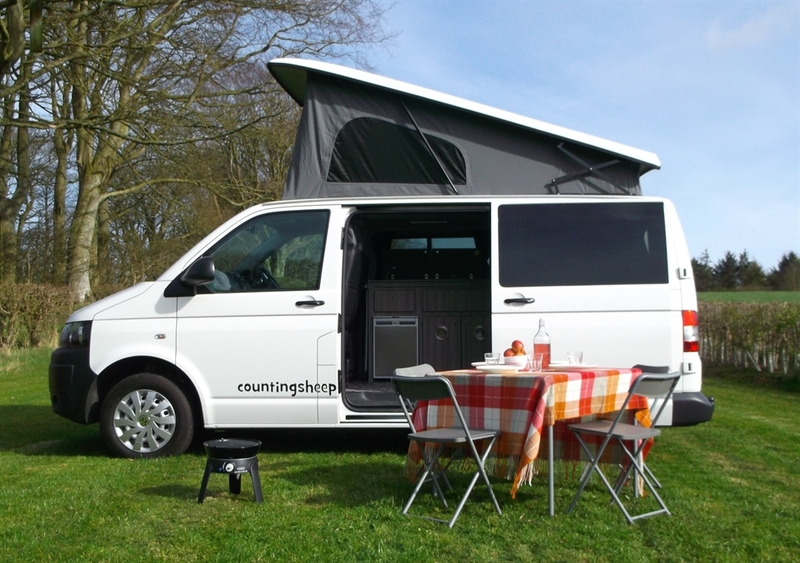 Our range of campervans can sleep upto two adults and two children. If you wish to have additional sleeping space, you can select the optional inflatable awning. Optional extras include bedding, portable toilet, bike carrier, lockable activity trailer and driveaway inflatable awning. For ease of getting around, we include a large screen Satnav and road map to help you plan your trip. Also included is a Camping & Caravanning Club privilege membership as part of your hire with Counting Sheep Campers so you can use hundreds of sites across the UK at members’ rates. Transfers from our local transport hubs are available.